I figure most of the affected ER people here are watching closely but this will surprise many retirees. And all during a historic economic expansion. Absurdly irresponsible of the pension fund managers. Just a technicality - the article is about City of Chicago pensions, not the State of Illinois. The economic expansion bypassed the State of Illinois. "Illinois, in contrast, is the nation’s worst-rated by all three credit rating agencies. And it’s just one notch from being rated junk by Moody’s and S&P. Illinois is the financial deadbeat of the country." The only point I was making was the thread title says “Illinois” while the linked article is “Chicago”. They are different unrelated pension systems. You can add Kentucky to that sad list also. Keep in mind that the sinking ship makes the news. Nobody is going to write a headline like "100+% Pension funding in South Dakota". The city of Louisville, in Kentucky, is looking at raising taxes and/or dropping services already because of the state underfunding of the pension system. Everyone seems to be kicking the can down the road, but eventually I guess the bill has to be paid. 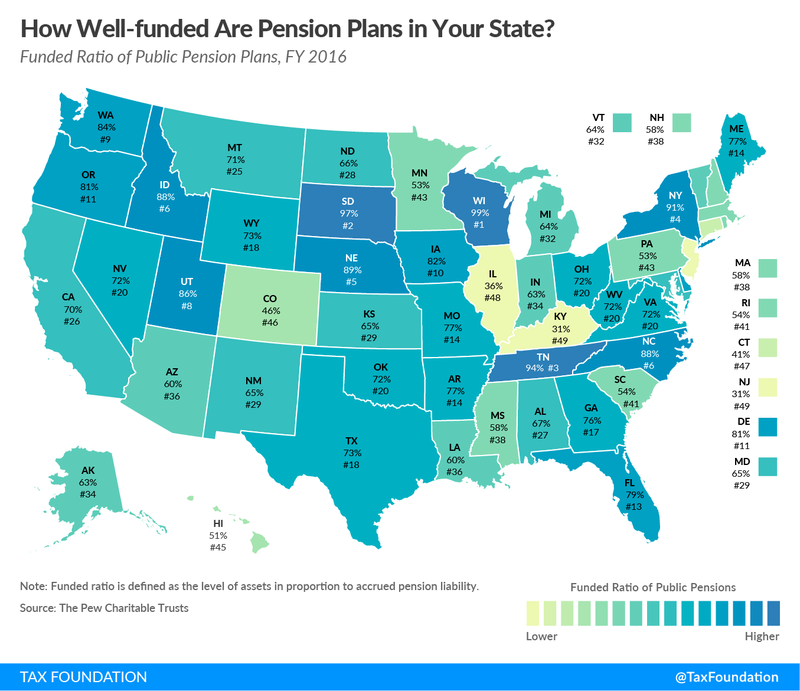 Might want to look at unfunded pension plans for any state you're thinking about moving to in the future. Kentucky and New Jersey are both worse. And we've chosen the state we're relocating to largely on the basis of how they've managed their financial health (mostly public pension liability) vs the others we were considering. So some people do care. the STATE pensuon funds in illinois are terribly under funded. by contrast the Illinois Municipal Retirement Fund is better than 90% funded. at least that's what they tell us. chicago is not part of IMRF. A promise is a promise, but there are differences in the how and why promises are made, but learning is part of the process. My campground neighbor, whom I dearly love and respect, retired from the Chicago Public School system at age 52, 13 years ago,with a (then) pension of $65,000. No envy for me, but happiness for the security she attained at an early age. Teacher pension contributions are out of sync with payouts. The average career teacher currently receives an annual pension of $73,350 and will receive a lifetime payout of over $2 million. The pension payout formula is based on Chicago teachers paying 9 percent of their salaries toward their pensions. Note the part about 9% and the actual numbers. Chicago police also do quite well. The scandal from a few years ago was that the average last 2 years pay set the pension amount, and studies showed that, overwhelmingly, officers nearing retirement received the most overtime hours. However this works out, my heart goes out to those who were promised and worked in good faith. Hopefully some light at the end of the tunnel. I'm getting ready for SS and retirement taxation in Illinois state taxes. Recreational marijuana maybe legalized and sports betting. Our roads and infrastructure are a disaster. Pot holes everywhere from the winters. Big city plans for renovations of the downtown here in Champaign. University is booming. Property taxes through the roof. Just raised minimum wage. Fingers pointed in every direction. And I'm tired of this frickin weather. Did someone mention pensions? Oh right, pensions. I see the creation of a "Chicago/Illinois Dollar" in the future, followed by Zimbabwe-style inflation. That's not enough information. You also have to look at their investment return assumption. MN was assuming, IIRC, 8% and telling everyone that the public employees pensions were well-funded. Then one of the rating agencies blew the whistle. MN is now using 7.5% which IMO is still optimistic and they are saying the pensions are something like 50% funded. Use of bogus investment return numbers is the easiest and least painful way for the politicians to kick the can forward. Yes it is a convenient way to not take fiscal responsibility; governments are known for this. Not to justify this but corporate America has behaved despicably over the past 3 decades with underfunding pension funds. Guess how, by doing this exact thing that public institutions have done, assume ridiculous returns on pension fund assets. How many public corporations still have pension plans? That number is heading towards ZERO. They have basically let their employees fend for themselves with 401K plans with very questionable fiduciary responsibilities. Many companies have allowed the financial industry to pillage the 401K funds with fee laden products. It is the travesty of our generation. It seems obvious that if they received 3x the payment of social security benefits, the new payment should be 1/3 of the current payout in fairness to everyone. Another method is to determine the amount to cut in order to keep the plan solvent. Raising tax or shifting money from the general fund, is not a viable or popular option. BTW, my comments may raise a lots of angers from the public pensioners. Interesting property tax info in your link. Property taxes for the medium home value in New York, New Hampshire, Connecticut and New Jersey are all higher than Illinois! New Jersey has the highest property taxes.